In addition to focusing on healthy lifestyle choices such as proper nutrition, stress management, exercise and sleep hygiene, some supplements can be useful to further support optimal mood and mental well-being. Serotonin is a key brain chemical that is linked to mood, happiness and overall mental health. Many pharmaceutical antidepressants work by increasing the amount of serotonin in the brain. There are supplements that can help with this as well. Interestingly, 90% of serotonin is actually produced by bacteria in your digestive tract. A high quality diet is paramount to having a good mood. It is always recommended to speak to your health care professional before starting any new supplements, especially if you are currently on any prescription medications. L-tryptophan is an amino acid used to synthesize serotonin that tends to induce calmness. It is naturaly found in many protein rich foods like poultry, yogurt, eggs and pumpkin seeds. 5 HTP is also used to synthesize serotonin and can do so more readily than L-tryptophan. It may help regulates sleep, appetite and pain as well as mood markers such as depression, aggression and anxiety. it has been used for depression, insomnia, binge eating, chronic headaches and insomnia. Vitamin B6 is needed to help turn both L-tryptophan and 5-HTP into serotonin, so a good supplement should also include this in the formula. Natural sources of B6 include fish, organ meats, starchy vegetables and chickpeas. Magnesium deficiency causes injury to cells in the brain and lowers serotonin levels that can lead to major depression. Some studies have shown magnesium to have antidepressant like effects comparable to pharmaceutical antidepressant drugs without the side effects. Foods naturally high in magnesium include spinach, swiss chard, almonds and pumpkin seeds. Valerian root is often used for reslessnessness. Chamomile flower produces a feeling of calm. 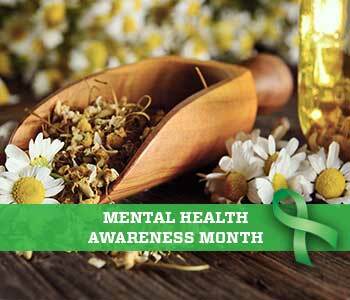 Lemon balm leaf can help maintain a positive mood and reduce mental stress. Jujube seed is used for occasional restlessness. Since most serotonin is produced in the gut, eating a diet full of fruits, vegetables and whole grains and limited in sugar, alcohol and processed foods will naturally help boost your mood. A probiotic supplement will not replace eating real foods, but may help especially if you have taken antibiotics or have previously had a poor diet. Foods naturally rich in probiotics like yogurt, miso kimchi, sauerkraut, kefir and kombucha are also a great way to introduce healthy bacteria into your gut.